Café RoyalThere are 30 products. Take advantage of this pack to discover the range of Nepsresso ® compatible capsules of the Café Royal brand.This pack consists of: 10 Dark Roast capsules, 10 Agent\'s Choice Espresso N0.2 capsules, 10 Ristretto Intenso capsules, 10 Doppio Espresso capsules10 capsules La Laguna and 10 capsules Dark Roast. Nespresso ® compatible Café Bio Lungo capsules. 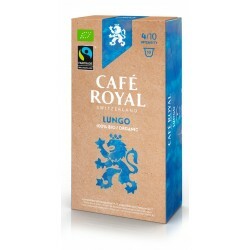 Lungo Bio is a capsule from organic farming, it is also certified Fairtrade. This Lungo Bio is a rather light coffee with a delicate bitterness accompanied by a fruity aroma of grapefruit and a slight refined note of cereals, its intensity is 4/10. Espresso Bio capsules of the Café Royal brand Nespresso ® compatible. Espresso Bio is a powerful espresso with an intensity of 7/10, its bitterness is very well balanced and sublimated by a sumptuous note of liquorice. Café Royal's Espresso Bio is Fairtrade certified. 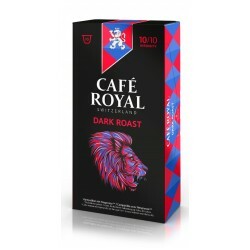 Nespresso ® compatible Dark Roast Café Royal capsules. Dark Roast, which can be translated by dark roasting, is a very aromatic espresso with a powerful roasting note, accompanied by light smoky notes. The intensity of coffee capsule Royal 10/10. 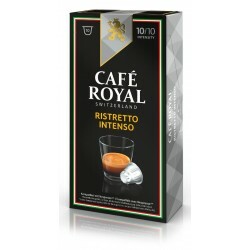 Ristretto Intenso is a capsule of the brand Café Royal compatible Nespresso ®. Ristretto Intenso has a body of character with a very powerful taste, accompanied by delicate notes of dark chocolate and wood, the intensity of this ristretto is 10/10.